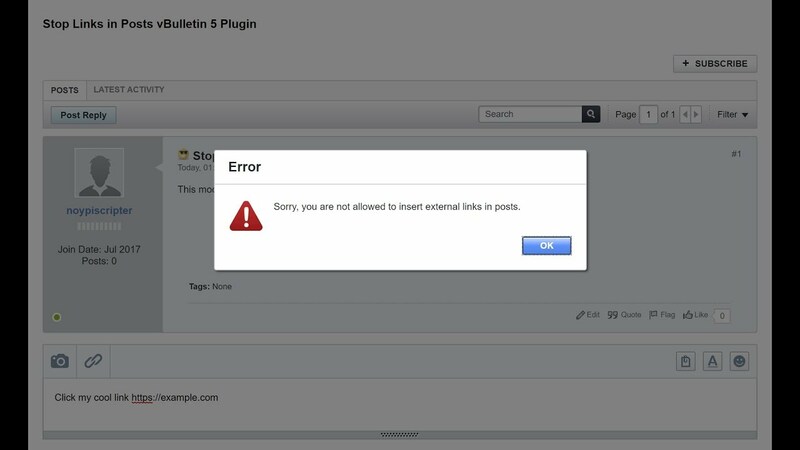 Stop Links in Posts - vBulletin Mods That Rock! Tired of spam bots or humans posting spammy links? Worry no more! This Stop Links in Posts mod validates links in posts by either preventing external links to be posted with an error message or automatically placing posts with external links under moderation. Can easily enable or disable mod without entirely disabling or uninstalling the mod. Can validate users posting external links by usergroup(s) only, post count only, either or both. For example, you could easily target users if they belong to Registered Usergroup, or if post count is less than 6, either or both. Can either prevent saving of posts with external links and display validation error, or allow posts to be saved but automatically place it under moderation. Only external links are detected and internal links (must be same domain as forum) are allowed. Also checks Link and Video content types. Validation error messages uses Phrase Manager so it can be re-worded or translated to another languange. Uses PHP hooks. This means that link detection is done on the server-side which is good because even if user is using an automated tool (which spam bots usually use) to post spammy links, the server will still be able to catch the error and prevent the posting or moderate the post. Uses Product XML system and requires file upload of the mod package to the server. For vB 5.5.0 and older, an existing PHP file in the vB5 codebase needs to be edited to manually add the needed missing PHP hooks that will be added in vB 5.5.1. Once vB 5.5.1 (which is the upcoming version at the time of this writing) is released, editing is no longer needed. A step-by-step process to edit the file is included in the installation instructions included in the package. This mod is installed on this site vbmods.rocks. Members of this site who have 5 posts or less will not be able to post external links. You can also watch the video screencast below to see the mod in action. Last edited by glennrocksvb; 03-02-2019, 07:51 PM. This will be an upcoming purchase I feel, now that I am on 5.5.1, this should hopefully yield a super easy install which is a bonus.